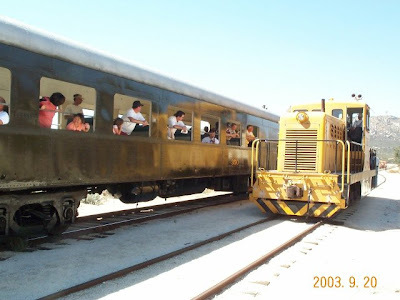 On Saturday, June 27th, to kick off Max's birthday week, we'll be taking a ride on the Pacific Southwest Railway Museum's Golden State Excursion. We'd like to invite one and all to join us for this little trip on an old train in honor of Max. We will post more about Max's birthday week as soon as we have it all nailed down. I think Max's birthday is the hardest thing for me to face so far. It's such an odd sensation not visualizing growth from one of your kids as their birthday approaches. Everything stands still at this point, and the "forever 7" doesn't seem so sweet at times like that. But I know with the support of all our Max followers we will weather this and be stronger in the end. I can sense your pain when writing this. You are not alone, and we will continue to make a difference. Max appeared in my dream last night. I'm not really sure why as I had never met him in real life. I found Max's site through another site and read about his battle for a few months until he succumbed. In my dream, he had a full head of shiny blond hair and was very happy and smiling. He is a very beautiful spirit. Happy Mothers Day Melissa. You were blessed with 3 beautiful children and they were all blessed with 1 beautiful mom. We all know how much Max loved his mom.